A customer called your company landline but could not reach anyone and ended up signing up with a competitor? of an always available, always reachable team. So do we. With COMMbits Cloud PBX, you get all the Enterprise-level phone features you need for your business, with low upfront costs and no hardware or software to maintain. Whether you’re operating from a single office or different locations in your city, state, or country, you get an enterprise-grade Cloud PBX phone system. Your mobile employees can be reached while on the go through your company phone number. What issues does Cloud PBX solve? all-inclusive features -complete access to more advantages! Note: 1-time local setup and configuration of your custom features (IVR and voice prompts, quick dial, etc.) is billed extra. Please contact us for details. 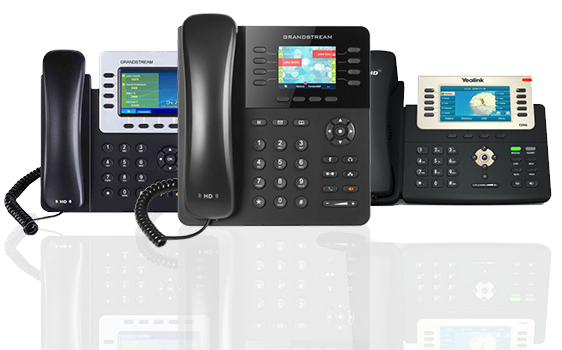 Cloud PBX and all extensions come configured with Busy Lamp Field, Intercom, Paging, Hunt Group, Audio Conference, etc. Users can receive unlimited simultaneous calls on their phone number. Users can place unlimited simultaneous calls. Call limitations exist on IP phones and Softphones. Route the call to a different destination (extension or auto-attendant) based on the number called. Record all calls from the beginning to the end. Record a call from a user. Return a call using the automatic redial function. Transfer a call to an external number/contact. Transfer a call to an extension. Transfer a call to voicemail. Notifications and faxes can be sent to multiple email addresses (no need to create a distribution group). The Auto Attendant receives calls, provides the caller with different assistance options and transfers calls. Leave a voice message when the user is unavailable. Read voicemail from IP phone, smartphone, email or web console. Forward a voicemail to another user. Forward incoming call to an extension. Forward incoming call to an external phone number. Display the phone number/name of the caller. Calling line ID will not be displayed when dialing out. User can pick an incoming call from another user or group of users. Indicates that a message is waiting in the user voicemail. Place/Resume a call on hold. Park a call from a phone and pick it up from another phone. Allows user to select the MP3/WAV music that will be played. Block calls from people who have blocked their caller ID. User will hear a tone that indicates a new incoming call. The current call can be put on hold to pick up the new call. When enabled, sends incoming calls to the VM. Highest performance audio codecs – G.722. An incoming call rings on all devices (IP Phone & Smartphone). Distribute phone calls from a phone number to a group of users/extensions. See whether or not another extension is busy. Block incoming calls that are part of a list of phone numbers. An incoming call rings a mobile/cellular phone when the user is unavailable. Ability to handle communication on multiple devices (desktop phone, mobile device (BYOD), web browser, PC). Place a call from a Web Browser. Send and receive faxes as PDF email attachments. 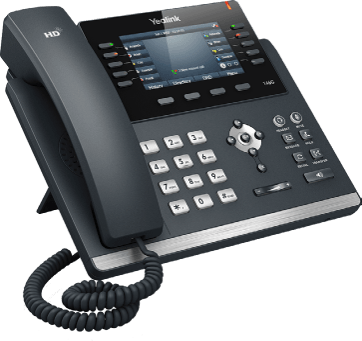 IP Phones are automatically configured on boot up. Softphones are configured automatically with a QR code. Simple steps. Start with your Premium PBX Service today!